It is hard to believe that this year is almost over. We have just hours until we shut the door to 2011 and move onto the next. The past twelve months have been wonderful and terrifying. They have been freeing and constricting. They have been a learning experience and a growing experience. I have come a long way from January 1, 2011. At that point, I still had a semester left in graduate school. I knew I was moving to Boston and so was Alex. I knew I had to look for an apartment and a job and a new life. I was outwardly confident and collected, but there were certainly times where I was questioning if anything would work out. Looking back, I can say they did, but I was not always as confident and certainly not so collected. It took a while for things to get but moving, but in March, Julia decided she was going to move to Boston. I got in touch with landlords. I came up here and lived off of Alex and my sister. I met a lot of people trying to make connections. I got a job doing something I didn't want to do. Jules and I moved into an apartment with our third roommate, Senty. The place was a mess. There was still furniture everywhere. Julia got a job. I started to think I would never be able to find a better job. Then I got a different job. The house is better. The jobs are stable. We are stable. Life is stable. With a little bit of time, and a lot of careful planning, you can produce something miraculous. And sometimes, that thing will crumble right in front of you anyway. Take for example, these shortbread cookies. Even when you are being meticulous and methodical, they may break while you are handling them. But, if you can deal with a few breaks and crumbles here and there, you can rest assured that these cookies are going to turn out perfectly, and so goes it with life. Happiest of New Years to all of my readers! May your 2011 end as you had planned and your 2012 begin with great joy and aspiration. 1. Cream together the butter and sugar until light and fluffy, about 3 minutes. Mix in the vanilla extract. In a separate bowl, whisk or sift together the flour and salt. In a third bowl, combine cranberries, pistachios and chocolate chips. 2. Add the flour & salt to the butter mixture and mix on low speed until it just starts to come together. 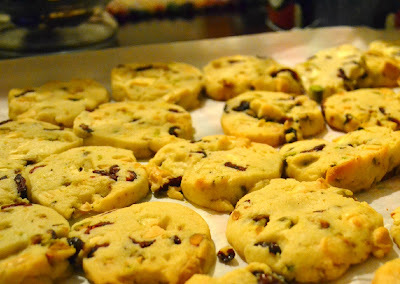 Fold in by hand the dried cranberries, pistachios, and white chocolate chips about a half a cup at a time until it's fully incorporated. Mix until the dough forms a ball. 3. Roll into a log about 2 inches in diameter (or wider or skinnier depending on how big you want your cookies). Wrap with wax paper and chill in the fridge for at least 1 hour. 4. Preheat the oven to 350F and line a sheet pan with parchment paper. Slice the cookie log into 1/4 inch slices and place the slices on the sheet pan. 5. Bake for 10-13 minutes, or until the edges are just starting to brown. Remove from the pan and cool to room temp. YUM!! I could see myself quickly eating TOO many of these! I love shortbread in any for and think these are amazing. What a way to send out 2011 and bring in 2012. Happy Near Year! Sounds like you had a big year! Wishing you a great 2012!